It feels like we’ve been talking about spring 2019 fashion trends for a while now, but it isn’t even spring yet! Just a few more days. Warm weather is coming friends! In our opinion great fashion comes with the warmer weather months so we are excited to see what everyone is wearing for 2019. But one of our major Spring 2019 Fashion Trends here at Garbarini is snakeskin. This pattern comes in all different styles of pieces and we’re here to showcase some of our favorites. Snakeskin is a fun way to show your bold side and we’re here living for it! 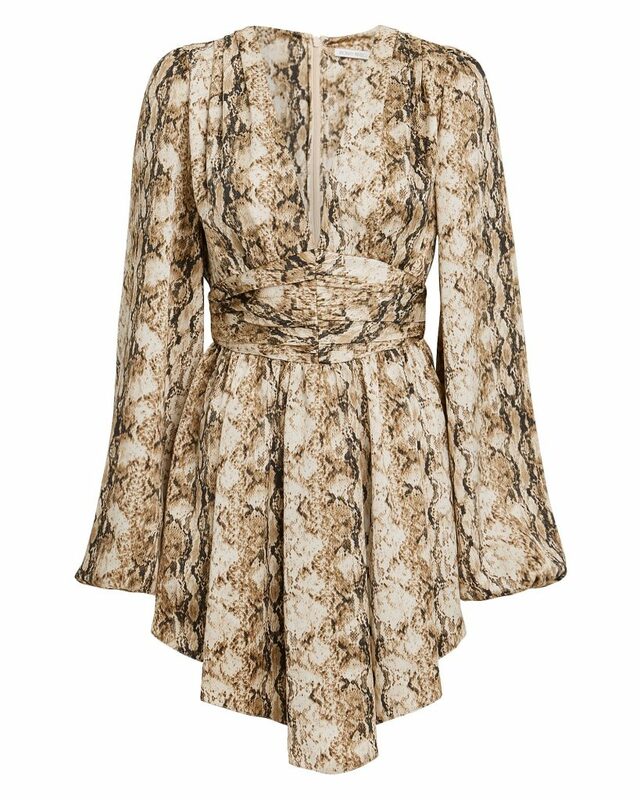 Our first piece is a snakeskin mini dress. This is by Ronny Kobo and is the perfect dress for spring. We like that it has longer sleeves making it great for this not quite hot spring weather. This dress has a plunging V-neck and ruched waistline making it a flattering flowy dress anyone can rock. This dress is easy to elevate with heels or booties or could be worn more casually with flat sandals. Come try it on in Garbarini today! 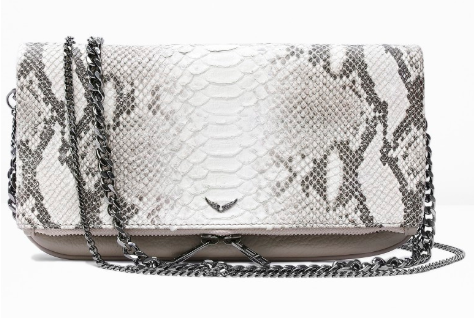 Another snakeskin piece we have in store at Garbarini is this Zadig & Voltaire Rock Cobra Clutch. This is the perfect accessory piece that makes a statement but isn’t too loud about it. It’s made out of snakeskin print leather with two removable chains so you can wear this clutch cross body or on the shoulder. We’re loving that a snakeskin clutch is part of this collection of Spring 2019 fashion trends. These are highly functional flowy snakeskin pants. These pants hit right at the ankle so they’re perfect for ankle boots or a cute slip on shoe as well. The Ceylon B Pants would pair very well with a white top, even just a plain white t-shirt would be cute. Our stylists in Garbarini are available to help pair pieces together and create the perfect outfit, hopefully featuring some fun snakeskin patterns! What a fashion statement this blazer is. It comes in a fun electric yellow/brown color. There are matching pants that go with the blazer as well. This is a fun snakeskin print blazer that you can make a great outfit out of. In my opinion, you could dress it down for work with some black ankle length slacks and a black top. But if you want the full electric yellow/brown eye popping experience, I think it would be a great pant suit combo for nights out. In the picture below it is paired with a fun belt to add to the complete ensemble. Patterns are in this spring! Especially, snakeskin. But at Garbarini we have a plethora of animal print and other patterns available. These pieces featured are some of our favorites and we think they will be great spring 2019 fashion trends. Come into Garbarini today to have one of our stylist’s help create the perfect outfit for you.